A completely revised and expanded new edition incorporating an impressive amount of additional material and illustrations. 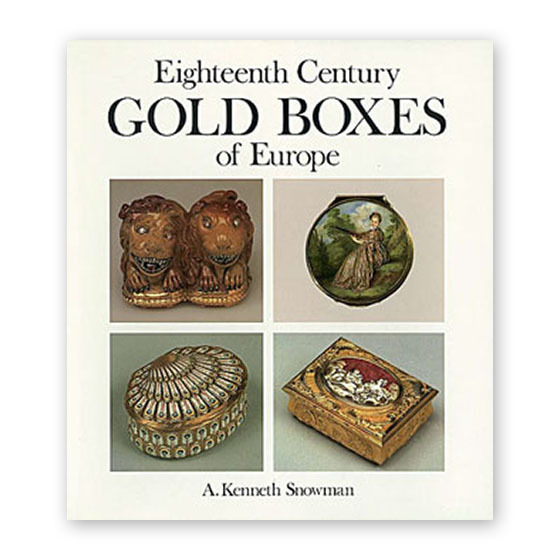 This luxurious book provides a carefully documented and profusely illustrated history of European gold boxes, principally of the eighteenth century, since this was the siècle de la tabatière, and discusses in details the many beautiful materials used in conjunction with gold, and the various techniques of their manufacture and decoration. The methods of hallmarking adopted are examined, together with the question of maker's marks and date-letters. Since the publication of the first edition, twenty-four years ago, the author has continued his research into this rewarding branch of the decorative arts and has made a great many discoveries which will add significantly to our appreciation and understanding of the subject. Public, private and Royal collections from all over the world have co-operated with the research into what has come to be recognised as the standard work on the subject. The number of illustrations accompanying the text has been dramatically increased and no fewer than 383 are colour plates. These have been arranged in chronological order so that the fascinating history of these superb small objects, many of which were enamelled or set with precious or semi-precious stones, is brought to life before the reader as the five hundred pages of this sumptuous book are turned.